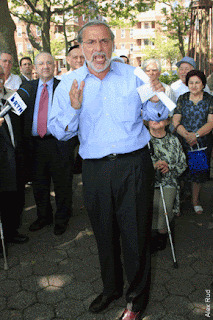 The New York Post reports Dov Hikind's opposition to including gays etc...in Sheepshead Bay Holocaust Memorial. I understand the Assemblyman's upset, however he's around ten years too late and too local. Kindly see my attempts to deal with this problem on a much bigger level through a Federal Law Suit opposing the Battery Park Holocaust Museum as reported by the JTA internationally on June/5/1997. Dov, your only 12 years too late. Welcome aboard. Perhaps you can address the "BIG BOY" Holocaust Museums which are being used to promote the homosexual agenda for the last 15 years.